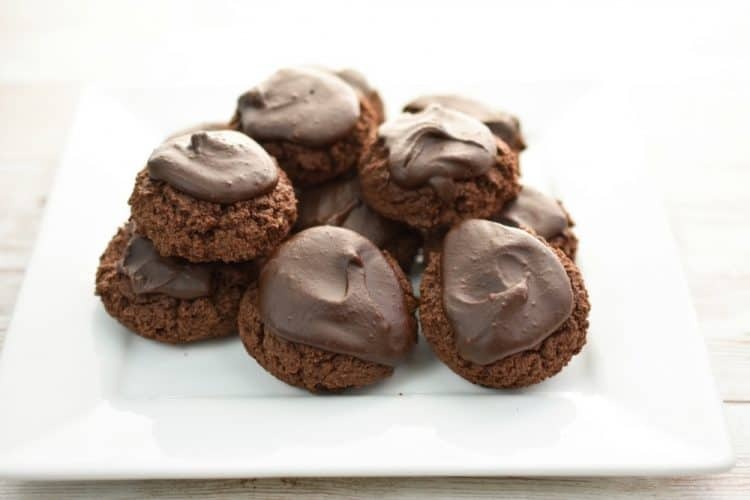 These keto cream cheese chocolate cookies make the perfect low carb chocolate treat. They are low in carbs, gluten-free, sugar-free, and nut-free. What makes these keto cookies extra special is the rich chocolate glaze that tops them. And because these cookies are so decadent one cookie will satisfy your chocolate craving. If that’s not a winning low carb cookie recipe I don’t know what else is. I created these low carb cream cheese chocolate cookies after so many you loved my keto lemon cream cheese cookies, my keto orange cranberry cream cheese cookies, and my nut-free, egg-less keto cream cheese cookies. I figured if you loved those other cream cheese cookies, you would embrace a chocolate one too. Thankfully, I was correct and today it’s helping people stay faithful to the ketogenic diet. And that my friend is what keeps this girl encouraged to keep coming up with keto recipes. Can you tell that I am a huge fan of adding cream cheese to my keto baked recipes? But why is this? Well, because the creaminess and richness that it adds are unmatched. Make sure you remember to also check out our Keto Cream Cheese Recipes for other delicious recipes that feature cream cheese. And if that’s not enough I have a complete list of Keto Cookies that as a fan of cookies I encourage you to also visit. BUT…can I tell you that I didn’t start adding cream cheese to my cookie recipes until I made eating low carb a lifestyle? I began to use cream cheese in my keto baked goods to test a theory I kept toying with. 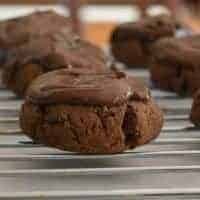 I wanted to see if adding it to recipes like these keto cream cheese chocolate cookies, would add structure and moisture to my low carb recipes. I am so grateful my theory proved to be right and thus began my love affair with adding cream cheese to my keto baking strategy. Of course, without a doubt, the star on the blog regarding cream cheese is my recipe for keto cream cheese pound cake. It’s a favorite not only on our site but in the keto community. You wouldn’t think that cream cheese would add such a great impact when baking with low carb keto flours. BUT… I’ve personally found that it really does help a lot with giving gluten-free items structure and flavor. Learning this firsthand has come in handy when keto baking. Although not a must per se, it is a great option for those who have no problem with dairy. The end result of these keto cream cheese chocolate cookies is a recipe for soft-batch buttery cookies. These are rich chocolate cookies that melt in your mouth, but that you can somehow still sink your teeth into. I hope that describes this cookie adequately. You see the addition of cream cheese to low carb cookies, gives a deep richness to the cookie dough and frankly intensifies the buttery flavor. How can you go wrong with more butter taste? You can’t. So enjoy my keto friends! NOTE: The full recipe and instructions are at the bottom of this post. Keep in mind, that you must use the cream cheese that comes in a block and not the one that is spreadable. This is key to getting the right results with this keto cream cheese (chocolate) cookie recipe, or any of my other recipes that use cream cheese. AND… for goodness sakes, use full-fat cream cheese. This is, after all, a keto recipe blog. Do take full advantage of the rich ingredients that you can have on a low carb, keto plan instead of focusing on what you can’t have. I think that’s a mistake that people make when they first embark on a keto diet. Instead of looking longingly at the list of not permitted ingredients, enjoy the rich list of keto foods that you can have. You do know that all the flavor is in the fat right? It’s why when our country went low-fat they loaded up the food with sugar to compensate for the lack of flavor. Ugh, how on earth did we fall for this big fat lie? Probably the worst health propaganda we bought. The consequences of which we are still dealing with. I wonder 100 years from now what will the history books say about the way we shunned fat and made ourselves sicker by pouring sugar on everything? I do pray that the truth will set people free. So, do yourself a favor and enjoy every bite of these keto cream cheese chocolate cookies knowing that the added healthy fats will help put you into a state of ketosis. And have the cookie in front of your non-keto friends to help spread the news of this wonderful life-giving lifestyle. A tip we like to share is the use of exogenous ketones. Randy and I are able to enjoy higher in carb keto treats by using this supplement. BUT…what is exogenous ketones? It simply means you are able to take ketones externally, rather than depending on your body alone to create them in the liver. Why should you even consider taking exogenous ketones? Especially if our body can make them? The answer is mainly to be able to get into ketosis and to remain in a fat-burning state. It’s a great tool especially when you are first embarking on a keto diet. Or in the event, you eat something that is higher in carbs and it kicks you out of ketosis. For example, Randy and I will have a serving of exogenous ketones after consuming healthy foods that are higher in carbs. We also take them for a boost of energy. However, this does not mean that we advocate eating a diet full of junk, nor does it give a license to cheat. You can’t just take ketones exogenously and ignore what you eat. In our book, that is not being good stewards of our body and in the end, can lead to poor eating habits. On the contrary, we believe in combining the keto diet with our Christian faith for optimal results. For us, its a lifestyle and you should know that what constitutes as “cheat” for us would be whole foods we don’t normally consume, like a serving of beans or sweet potatoes. Once fully combined add the 4 eggs one at a time, making sure that the batter is fully incorporated. To the cookie dough add the melted chocolate and beat dough until it's perfectly mixed. Next stir in the coconut flour, cocoa powder, baking powder, instant coffee, salt and mix well. Stir in the pinch of sea salt and instant espresso coffee. Add the cookie dough in spoonfuls to a parchment lined cookie sheet. Spread about a teaspoon of icing onto each cookie. Allow the icing to set about 5 minutes. Get Our Keto Diet Starter Guide FREE! When you sign up our newsletter, we will send you our 5 Easy Steps to Start a Keto Diet Guide for FREE! No worries, I promise not to bombard you with emails, and I will not share your email address with anyone else. Signing up is also a convenient way to get our latest recipes, tips, and offers. You may unsubscribe easily at any time. Hi there, these look and sound delicious! I track total carb count versus net so I wanted to ensure that I have it correct that there is 11.2 grams of carbs in a single cookie? I have not seen where the sugar is broken out from carbs and fiber count. Hi Hilda, thanks for the info on the sugar and the link. Just to ensure I am understanding the #’s, is it safe to say that the total carb count is 7.3g? And of that 7.3g the sugar amount is 3.9g? I have an app I use to track and it is simple total carbs, total fat and total protein, that is as detailed as it gets. I wanted to put this recipe in that appt journal so I can track correctly. Hi Alisha, usually what people deduct is the fiber from the carbs. In this case, the recipe has 6.2 total carbs of which you subtract 1.1 for net carbs of 5.1 per cookie. Hi Judy, it’s unsweetened baking squares. Hope that clarified it. Thanks for stopping by. Hi Debra, I guess it’s kinda like a glaze/icing. It should firm up though. I’m glad you enjoyed them. Do you know what the carb count is without the icing? Have you tried freezing the cookies. Hi Sue, I have frozen without issue these cookies. What exactly do you use for the instant expresso coffee? That’s the only thing I don’t have in the house. Can you use regular coffee? Hi Heidi, If you do not have any on hand just leave it out. The coffee just enhances the flavor. You can't use regular coffee because it would add unnecessary liquid. This is an example of what I mean by espresso instant powder: https://www.amazon.com/gp/product/B01LTI9DH2/ref=as_li_tl?ie=UTF8&camp=1789&creative=9325&creativeASIN=B01LTI9DH2&linkCode=as2&tag=fittoserveg06-20&linkId=0b16eb7c16f1f2be9589c12e866571fa If you happen to have regular instant coffee this also would work. These are the best!!! I used a pamper chef cookie scoop, so it made about 40. I used a different glaze (one I am in love with), however the cookies are great with no glaze. Definitely will make many times. Wonderful Vickie! Glad you enjoyed them.